Memorial Day Weekend is Here!!! After finishing up a busy winter season here at the Bimini Sands Resort & Marina, we're now gearing up for the official start of Bimini's busy summer boating season, and we couldn't be more excited about it! All year round, Bimini Sands offers the best facilities and amenities on the island. Our marina is the most sheltered marina on the island, and our floating docks make docking as simple as can be. We've got 3 restaurants and 2 bars on our properties, including the Beach Club Restaurant and Mackey's Sand Bar. Our condos offer luxurious lodging with the best views of Bimini's legendary beaches and dazzling waters. And Bimini Sands also has the quickest access to Bimini's fishing and diving destinations. Starting this weekend, our Recreation & Activities team will be offering weekly Shark Encounters, Snorkeling Trips, Kid's Club activities, Sunset Island Tours, Free Family Movies on the Beach, Banana Boat Rides, and much, much more! We've even got the Bimini Stompers, Bimini's premiere Junkanoo ensemble, performing right on our property every week! Make sure to check out our website often to book your room, dockage, or space on our exciting activities... We look forward to seeing you soon! 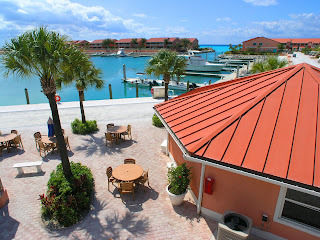 In January of 2009, Bimini Sands became the first official Shark Free Marina in the Bahamas. In an effort to help keep the oceans clean and fish stocks thriving, we're asking that our guests strictly practice "Catch & Release" with all sharks hooked around Bimini. Our Recreation & Activities Directors, Grant & Katie, are actually former shark researchers and are always willing to discuss the importance of sharks to the Bahamas, and the oceans as a whole. Now, after just a few short months, the Shark Free Marinas Initiative is steadily gaining momentum! More and more marinas around the Bahamas are signing on every week, and the initiative is even spilling over to other countries around the globe. Check our the new Shark Free Marinas website here, and click the video below for more info on this important effort. And in other Shark News, Bimini Sands was recently listed at the end of an exciting episode of the National Geographic Channel's hit show "In the Womb." The crew from Nat Geo came to Bimini last year to work with Bimini's famous lemon shark population, and like many other production companies, they chose Bimini Sands Resort & Marina for their accomodations. Click here for more info on the show.